The open letter Joseph El Khoury addressed via Arabdemocracy to the Secretary General of Hizbullah Hassan Nasrallah generated many constructive comments regardless of whether they agree or not with the writer. Below a reply to the letter showing how strong the arguments in both sides can be. But the most important is that these two letters show how deep the Lebanese fracture is and how large is the space separating the two Lebanese parallels that might not intersect in infinity. It appears that you and I have much in common. To the best of my knowledge we are both Lebanese, we both love our country, and we also fans of poetry, good literature, and Fairuz. I am not sure who your favorite writers are Mister Prime Minister, but I am particularly drawn to Khalil Gibran and Voltaire – two great writers in my humble opinion - whose search for more light and the truth in their writings brought comfort to me in times of trouble and discomfort. In these times of uncertainty in the homeland, as you might expect, I find myself searching for answers yet again in the writings of these two great gentlemen. In his essays on the meaning of law, Gibran warns against those man-made laws that are a reflection of our own likeness which can be washed off by angry waters much like the sands of the seas. Voltaire, on the other hand, believes we are guilty of the good we have not done. Mister Prime Minister, since you took office three years ago, your government has made many promises that have yet to bear fruit. Mister Prime Minister, where are we on the new electoral law? Mister Prime Minister, where are we on installing a government of national unity? You claim that your party holds the majority of views in our land but you must stand corrected sir as the nation is clearly divided, though recent reports indicate the opposition is gaining ground. Mister Prime Minister, you have promised relief to the people affected by the war in 2006, but there are reports that prove your government’s contribution has been nil at best? Mister Prime Minister, Hezbollah is no longer the only armed militia in Lebanon , are you aware? Mister Prime Minister, we are repeating the mistakes of the past and wishing for better solutions. Mister Prime Minister, our economy is soar, our people are leaving, and we are divided on sectarian grounds again. Mister Prime Minister, what has your government achieved over the past three years? Mister Prime Minister, you claim your resignation is an open ticket for Syria and Iran to meddle in Lebanese Affairs, but aren’t your current policies a reflection of Saudi Arabia ’s agenda in the Middle East and more particularly in Lebanon ? Mister Prime Minister, shouldn’t we work toward policies that reflect our interests first? Mister Prime Minister, for the past nine years I convinced myself that my experience and education in the United States of America, a country I proudly call home away from home, will only help, upon my return to Lebanon, to better prepare me to contribute to the building of a viable nation; a republic founded on equality, fraternity, and truth; a nation where men and women hold equal rights and duties; a nation free from religion but not against it; a nation that cares about its environment and the well being of its people, all its people; a nation that works with as opposed to for other nations; a nation that for once in its history will decide its own faith. Mister Prime Minister, does your government have a vision? If so, is this vision inclusive of all the citizens of Lebanon ? Mister Prime Minister, I am proud to be the son of Lebanon, the land that produced Gibran, Fairuz, Hiram Abiff, and many other great minds, but I am disappointed with the way my government has conducted business since 2005. Your government, sir, called for the establishment of an accountable system to fairly evaluate the performance of public officials. Your government continues to blame the oppositions for the current situation in Lebanon, however; with governance comes responsibility. It is high time Mister Prime Minister for a government of national unity, a government that reflects the interests of Lebanon first and foremost without disrupting our regional and global relationships. 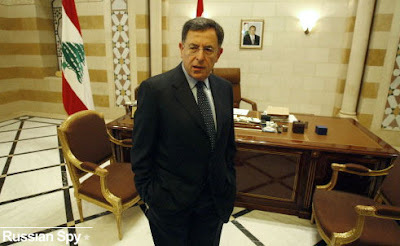 Only then would the turmoil in Lebanon ends. Only then, Mister Prime Minister, the many bright Lebanese both locally and abroad would regain trust in the homeland and contribute to the construction of a sound and viable republic. Your letter is great. Style wise. But there is only one thing missing: in all democracies the opposition criticizes the government, but it also let's it run the country. In Lebanon, the opposition (which you obviously support...considering your previous posts) hijacked the parliament, and now uses its weapons to kill people. I would like to know, Mr. Madi, what is the "sound and viable republic" you talk about? one where the media is burned ? one where OTV considers itself to be the "most objective TV channel in the universe?" (Jean Aziz, OTV's director) One where weapons are used to terrorize civilians? one where pro-Hezbollah supporters are allowed to never pay their electric bills ? J - I am not sure how you "clearly" concluded I support the opposition "based on my earlier" posts. I don't support either J., but I do support the constitution and the law. This government of ours is unconstitutional according to and Article(I forgot the Article number) in the constitution by lawsd. Furthermore, Lebanon's democracy is such that the people are allowed to, in fact, they are expected to revolt against a government that is not representing the people, and they have. No one had issues with bringing down the government of Mr. Karame, so why is there an issue with bringing down the government of Mr. Saniora? Stating the obvious J does not render me a fan of either blocks. The fact remains that Lebanon remains governed by tribal politicians and the people, the majority of people, support that. There are sides however that support different tribal leaders. Concerning your remarks about weapons and media. I think you should revisit your sources to confirm that Hazbollah was the only party with weapons in Lebanon as of late and have used them. Apparently there are also loads of weapons in areas such as the mountains, Keserwen, and Tripoli.I forget they are allowed to bear arms, eventhough it is not under the auspice of the government. Remember the whole Mohamad Cartoon debacle? Maybe not...Also, I have yet to see a media outliet that doesn't claim they are the most reliable, trustworthy, and balanced, so I'm not sure why it is so unsound and unvialbe that OTV claims it is, in light of such media outlet as NBN, Manar, LBC and FTV. These conclusions "a la libanaise" about MY political views are unfounded. But I guess if you don't like what I have to say, you assign me to one political group or the other, and that J is the clear part. Thanks for the compliments about my writing style, they are appreciated and a good boost to my seemingly fragile ego. As all of Michel Aoun supporters, all of your arguments are fakes and made up. You probably live outside Lebanon, if you lived here you would have realized how much the Lebanese people are fed up of your sides lies and systematic destruction of Lebanon. 1) The government IS unconstitutional since the department of the President of the Republic. Whatever side you are on, the country is above all personnal interest. 2) The Lebanese government, by law, is representative of all the Lebanese, with the resignation of the Shiite miniters, said representation is aborted. The same would and should apply had the Sunnis or a portion of the Christians not been represented. It is unfortunate that such is the condition in the Republic but since we are talking about rules and regulations, we better stick with them. 3) The right to go on strike and call for the abolishment of the government is a right and duty according to the rules and regulations of this Republic of the State of Lebanon. 4) You keep on going with your assumptions about my political allegiance. Making baseless assumptions is laughable. 6) Interesting how you have no fear in voicing your opinion, yet have a hard time stating your full name. What's the fear there? "who,let's , listener, somebody" etc..
Sirine - You crack me up! Hiram Abiff was a king of Tyre. He was instrumental in helping to build King Salomon's Temple in Jerusalem. Sirine - again YOU CRACK me up. Tayib ya sitti ha'ik 3laye. My bad mitil ma beoulo el Amerken.